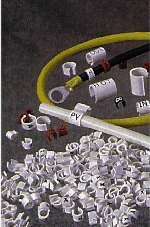 A rigid marker that will "snap-on" a wire/cable or tubing. These markers are specifically designed for applications after the termination has been made or solderless terminal has been attached.The marker's installation guide provides for easy application. The interior smooth design will not damage or pinch the wire or tube. The same markers can be used for either right or left hand entry. They may be removed at any time for recoding without breaking the terminal connection. Any number of markers arranged in any sequence can be assembled to provide the necessary code. Hot stamped markings can't rub-off, fall-off, or peel-off. Markers allow for durable handling. Rigid Snap-On Markers are not sticky or messy. Installation is achieved without the aid of a tool. Manufactured of durable, rigid PVC. Highly resistant to abrasion, grease, oil and chemicals. UL Recognized 94V-0 Rated. Standard markings are numerals 0 to 9, letters A to Z, and symbols (electrical) upon request. Multiple markers of any 2, 3, 4, or 5 unit combinations of above. White with black markings is standard. Markers in colors are available.. There are 100 single markers of same size and marking per package and 1000 markers (bulk) of same size and marking in a poly bag.